The 4th East Asia C. elegans Meeting Abstract, p. 98, Tokyo, Japan, July, 2010. 日本ロボット学会誌, Vol. 28, No. 5, pp. 606-613, 2010. Hiroshima Journal of Medical sciences, Vol.58, No.4, pp.75-82, December 2009. 医療機器学, Vol. 80, No. 3, pp.196-204, Jun. 2010. バイオメカニズム学会誌, Vol.34, No.2, pp.100-104, 2010. Robot Manipulators Trends and Development, Edited by Agustin Jimenez and Basil M Al Hadithi, pp. 213-230, INTECH, March 2010. 計測自動制御学会論文集, Vol. 46, No. 2, pp.123-129, 2010. 日本義肢装具学会誌，26巻, 2号, pp. 91-96, 2010. New Developments in Biomedical Engineering, Edited by Domenico Campolo, pp. 373-390, INTECH, January 2010. Medical and Biological Engineering and Computing, Vol. 48, No. 4, pp.351-359, April 2010. Artificial Life, Vol. 16, No. 2, pp.155-177, Spring 2010. Proceedings of the International Multi Conference of Engineer and Computer Scientist 2010 , Vol.I, pp.180-185, Hong Kong, March 17-19, 2010. 電気・情報関連学会中国支部第60回連合大会講演論文集, pp．355-356, Oct. 17, 2009. 計測自動制御学会論文集, Vol. 45, No. 12, pp. 724-730, 2009. Artificial Life and Robotics, Vol. 14, No. 3, pp. 342-347, 2009. Proceedings of the International Symposium on Early Detection and Rehabilitation Technology of Dementia 2009 (DRD2009), pp. 115-118，Okayama, Japan, December 2009.
International Conference on Neural Computation 2009 (ICNC 2009), Madeira, Portugal, Oct. 5-7, 2009.
International Conference of Computational Methods in Sciences and Engineering 2009 (ICCMSE 2009), Rhodes, Greece, Sep. 29-Oct.04, 2009.
International Multi Conference of Engineer and Computer Scientist (IMCECS 2010), Hong Kong, Mar. 17-19, 2010 (in press). Proceedings of the 9th International Conference on Information Technology and Applications in Biomedicine, ITAB 2009, Larnaca, Cyprus, 5-7 November 2009. The IASTED International Conference on Human-Computer Interaction 2009, pp. 322-327, St. Thomas, US Virgin Islands, Nov. 22-24, 2009. Pattern Recognition Technologies and Applications: Recent Advances (Brijesh Verma and Michael Blumenstein, Ed. ), pp.370-387, 2008 (Information Science Reference). Proceedings of the 2009 IEEE International Conference on Systems, Man, and Cybernetics, pp. 2507-2512, San Antonio, Texas, USA, October 2009 11-14. Proceedings of the 2009 IEEE International Conference on Systems, Man, and Cybernetics, pp. 1736-1741, San Antonio, Texas, USA, October 2009 11-14. Proceedings of the 31st Annual International Conference of the IEEE Engineering in Medicine and Biology Society, pp. 2663-2667, Minnesota, USA, Sep. 2009. European Control Conference 2009 – ECC’09, pp.2319-2324, Budapest, Hungary, August 2009. Proceedings of the 31st Annual International Conference of the IEEE Engineering in Medicine and Biology Society, pp.2663-2667, Minnesota, USA, Sep. 2009. European Control Conference 2009 – ECC’09, Budapest, Hungary, August 2009 (in press). 17th International C. elegans Meeting Program & Abstracts, p. 278, Los Angeles, USA, June, 2009. IEEE Transactions on Robotics, Vol. 25, No. 3, pp. 502-511, June 2009. 31st Annual International Conference of the IEEE Engineering in Medicine and Biology Society, USA, September 2009 (accepted). 日本ロボット学会誌, Vol.27, No.4, pp.434-441, 2009. 計測自動制御学会論文集，Vol. 45, No. 4, pp. 224-232, 2009. Sensors, Vol. 9, No. 3, pp. 2187-2201, 2009. 人間工学, Vol. 45, No. 1, pp.36-45, 2009. Singapore, December 3 – 6, 2008. 14th ’09), GS13-6, Oita, Japan, Feb. 5-7, 2009. 14th ’09), OS15-4, Oita, Japan, Feb. 5-7, 2009. Information and Control (IJICIC), Vol. No. 1, pp. 1-15, March 2008. 医療機器学，Vol. 78, No. 12, pp.909-918, 2008. (ICBME2008), 2E-2-09, Singapore, December 2008. (ICBME2008), 2B-3-02, Singapore, December 2008. (ICBME2008), 2B-3-04, Singapore, December 2008. (ICBME2008), 3B-2-08, Singapore, December 2008. – 2007, pp. 723-729, Shanghai, China, November 2007. (ROBIO2008), December 14 -17, 2008, Bangkok, Thailand, 2008.
the IEEE Engineering in Medicine and Biology Society, pp. 4190-4193, Vancouver, Canada, Aug. 2008. 5628-5631, Vancouver, Canada, Aug. 2008. 112-116, Vancouver, Canada, Aug. 2008.
pp. 303-318, Springer, Heidelberg 2008. The joint congress of the 45th Annual Meeting of the Japanese Society for Artificial Organs & the 2nd Meeting of the International Federation for Artificial Organs, p. 72, Osaka, Japan, Oct. 2007. 電子情報通信学会誌，Vol. 90, No. 10, pp. 854-858, 2007. 計測自動制御学会論文集，Vol. 43，No. 9，pp. 821-818, 2007. 日本ロボット学会誌，Vol. 25, No. 6, pp. 874-880, 2007. 生体医工学, Vol. 45, No. 1, pp. 55-62, 2007. Proceedings of the 2007 IEEE International Conference of the Engineering in Medicine and Biology Society, pp.6051-6054, Lyon, France, Aug. 2007. 2007 American Control Conference (ACC), pp. 4077-4082, New York, July 2007. 精密工学会誌, Vol.73, No.3, pp.313-316, 2007. NHK生活ほっとモーニング, 2007年７・８月号(通巻26号), p. 58, 2007.
in Medicine and Biology Society, Lyon, France, Aug.
Conference on Complex Medical Engineering-CME2007, pp. p. 21, Scholastic, New York, 2006.
learning lead to changes in the networks? and Abstracts, p.112, Seoul, Korea, November 2006.
by exposure to ionizing radiation? The Seventh International Conference on Systems Biology (ICSB-2006), Abstracts, Paper No. BN03, Yokohama, October, 2006. Proceedings of the 2006 IEEE International Conference on Systems, Man, and Cybernetics, pp. 68-73, Taipei, Taiwan, Oct. 2006. Proceedings of the 2006 IEEE International Conference on Systems, Man, and Cybernetics, pp. 3612-3617, Taipei, Taiwan, Oct. 2006. 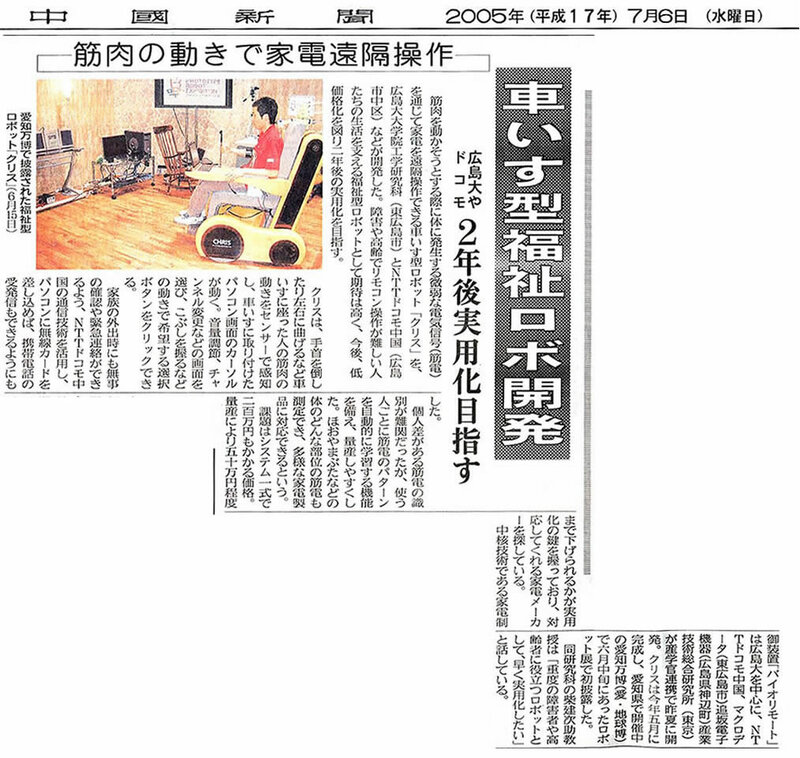 Dynamics 2006, A00643, August 2006.
in Medicine and Biology Society, New York, USA, Aug.
ロボティクス・メカトロニクス講演会’06講演論文集, 2P1-C-07, pp. 1-2, 2006. 計測と制御 ，第45巻, 第5号, pp.395-401, 2006. Journal of Robotics and Mechatronics (Special Issue on Selected Papers from ROBOMEC’05), Vol .18, No. 2, pp. 177-185, 2006. Experimental Brain Research, Vol. 170, pp. 141-148, 2006. European Journal of Neuroscience, 2006 (in press). 生体医工学，Vol. 43, No. 4, pp. 670-676, 2005. 生体医工学，Vol. 43, No. 4, pp. 677-684, 2005. Neural Networks in Healthcare: Potential and Challenges (R. Begg, J. Kamruzzaman, R. Sarker, Ed. ), pp.130-153, 2006 (Idea Group Inc.). Neural Networks in Healthcare: Potential and Challenges (R. Begg, J. Kamruzzaman, R. Sarker, Ed. ), pp.154-175, 2006 (Idea Group Inc.). AXIS, Vol.120, pp.76-80, April 2006. 日本ロボット学会誌, Vol.24, No.2, p.185, 2006. Proceedings of the Eleventh International Symposium on Artificial Life and Robotics, pp.313-318, Oita, Jun 2006. 日本フットボール学会 3rd Congress, p.48, 2006. 金属, 第76巻, 第1号, pp. 34-36, 2006. 第6回計測自動制御学会システムインテグレーション部門 講演会論文集, 2B1-1, pp. 495-496, 2005. 第6回計測自動制御学会システムインテグレーション部門 講演会論文集, 2B1-2, pp. 497-498, 2005. 第6回計測自動制御学会システムインテグレーション部門 講演会論文集, 2B1-4, pp. 501-502, 2005. 第6回計測自動制御学会システムインテグレーション部門 講演会論文集, 2B2-1, pp. 505-506, 2005. 第6回計測自動制御学会システムインテグレーション部門 講演会論文集, 2B2-2, pp. 507-508, 2005. 第6回計測自動制御学会システムインテグレーション部門 講演会論文集, 2B2-3, pp. 509-510, 2005. 第6回計測自動制御学会システムインテグレーション部門 講演会論文集, 2B2-4, pp. 511-512, 2005. 第38回日本人間工学会中国・四国支部大会 講演論文集 pp. 28-29, 2005. 第38回日本人間工学会中国・四国支部大会 講演論文集 pp. 30-31, 2005. 第38回日本人間工学会中国・四国支部大会 講演論文集 pp. 32-33, 2005. 第38回日本人間工学会中国・四国支部大会 講演論文集 pp. 40-41, 2005. 第38回日本人間工学会中国・四国支部大会 講演論文集 pp. 38-39, 2005. 第38回日本人間工学会中国・四国支部大会 講演論文集 pp. 60-61, 2005. The 48th Annual Meeting of The Japan Radiation Research Society/ The 1st Asian Congress of Radiation Research Proceedings, pp.130-131, Hiroshima, November 2005. Journal of Robotic Systems, Vol.22, No.11, pp.625-637, 2005. 計測自動制御学会論文集, Vol. 42, No. 3, 2006. IEICE Transactions on Information and Systems, vol.E88-D, no.8, pp.1903-911, 2005. Artificial Intelligence in Medicine, Vol.35, pp.75-86, 2005. 日本設計工学会誌, Vol..40, No.9, pp.444-450, 2005. Part II, pp. 165-174, Changsha, China, August 2005. 広島工業会誌, 第128号, pp. 20-31, 2005. Robotics and Autonomous Systems, Vol.52, No.4, pp.257-271, 2005. Proceedings of the 2005 IEEE/RSJ International Conference on Intelligent Robotics and Systems, pp.3543-3548, Alberta, Canada, August 2005. IEEE Transactions on Systems, Man, and Cybernetics, Part A: Systems and Humans, Vol. 35, No. 4, pp. 523-535, 2005. Preprints of the 16th IFAC World Congress, We-M10-TO/4, Progue, Czech Republic, July 2005. Preprints of the 16th IFAC World Congress, Th-A01-TP/4, Progue, Czech Republic, July 2005.